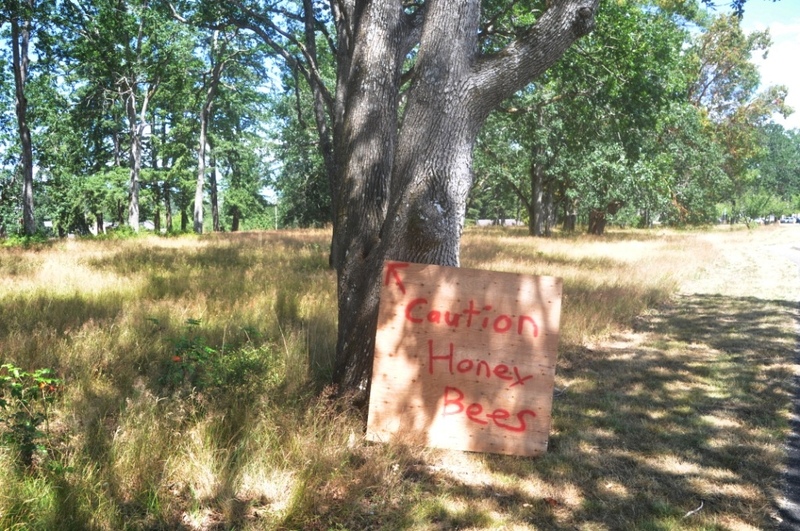 I was strolling along a walkway/running track in Camp Murray, Washington a while ago and noticed a very hard not to notice warning about a bee hive. Naturally I was prompted to take a closer look. It was a hive of honey bees, and a fairly new one judging by the furious activity going on. The queens of these bees live 2 to 5 years and produce colonies of well over 60,000 workers. 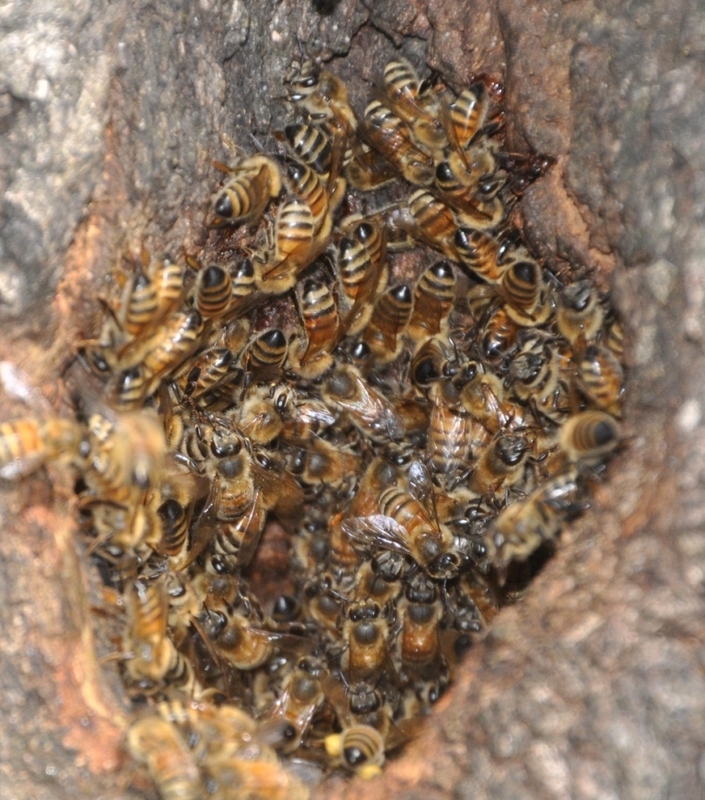 When she’s had enough of that she lays a few eggs destined to be new queens and then takes off with a swarm of loyal workers to found a new colony, generally in their favorite setting, a hollow tree like the one in the photo. 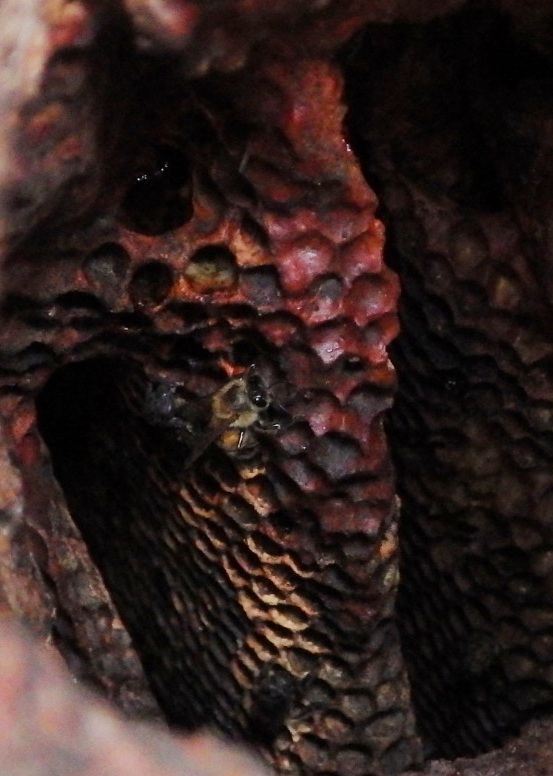 The deep hole in the middle of this oak tree provides a perfect home for honey bees. During the warmer weather they are extremely active, but in the winter things slow down considerably. The bees retreat into their hive and pretty much wait it out. That’s one method of getting photos inside of a bee hive, by the way – wait for winter. Not surprisingly bees have a higher mortality rate in the cold weather. But as seen in the last picture nobody can beat a honey bee for collecting and distributing pollen. Meanwhile back in the old hive the first new queen to emerge quickly assassinates her rivals, and takes up the task of producing thousands of new workers. This, of course, after mating with a lucky mail (drone) bee. (I say lucky because the remaining drones are shut off from food and starved to death by the female workers in the hive. At least the “lucky” guy got something out of life before expiring.) Despite their present ubiquitous appearance honey bees are not native to North America; they were brought here sometime in the 17th century for the same purpose they are cultivated and raised for now. 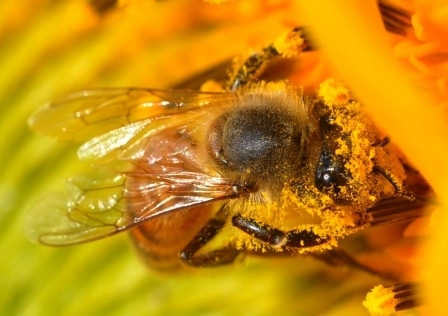 You kind of wonder why they had to do that since, according the Audubon Field Guide, about 3,500 species of bees are native to North America, all of which specialize in flower feeding and are by default pollinators. Unfortunately, the death rates of these extremely valuable insects continues to rise. Check out the article in Modern Farmer to learn more about that.